There will be English representation at Sunday’s World Football Cup Final after all thanks to the Cumbrian firm who have supplied and installed the revolutionary hi-tech playing surface, the first of its kind to be used in this showpiece occasion. 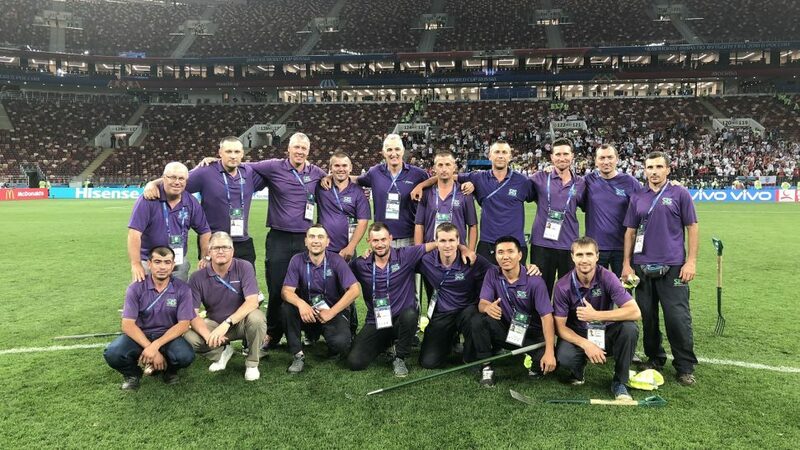 Cumbria-based SIS Pitches will fly the flag for England at the final between Croatia and France at the 81,000-capacity Luzhniki Stadum in Moscow after Gareth Southgate’s men were knocked out in Wednesday’s semi-final. SIS Pitches installed its hybrid surfaces using patented fibre injection technology with undersoil aeration system in six of the 12 tournament venues. The Luzhniki pitch uses SISGrass, – 95% natural grass reinforced with 5% synthetic fibres – and SISAir, a unique aeration system capable of removing a deluge of rain from the surface in just five seconds, whilst optimising root moisture via a network of undersoil pipes. George Mullan, CEO of SIS Pitches, said: “With around one billion people expected to watch the final, there’s clearly pressure to get the pitch in top condition, despite it being used for over 60 hours – the equivalent of a full Premier League season – in the past five weeks. That would have been impossible on a traditional all-grass pitch. The six World Football Cup stadia using SISGrass are Luzhniki, Spartak, Samara, Kaliningrad, Saransk and Rostov. Having installed over 80 hybrid surfaces worldwide, including English Premier League sides Chelsea, Newcastle United, Fulham and Bournemouth, as well as Scottish champions Celtic and the English FA’s St George’s Park complex, with Barcelona to follow, SIS Pitches predicts annual revenues will grow from £55m to £65m in 2019.